If you have a Stellar, Stellar Plus or Stellar Business plan (or old Value, Professional, Ultimate, Business plan) with us, you need to point your domains to	dns1.namecheaphosting.com and dns2.namecheaphosting.com nameservers. If the domain is registered with Namecheap, you can change the nameservers by following the steps below. Sign into your Namecheap account and go to Domain List. Click on Manage next to the domain in question. If your domain is registered with GoDaddy, follow the steps here. If you have a Reseller plan, you can use either shared reseller nameservers or your personal nameservers. You can look up shared reseller nameservers in your Hosting Welcome Email. Personal nameservers need to be registered and set up first. 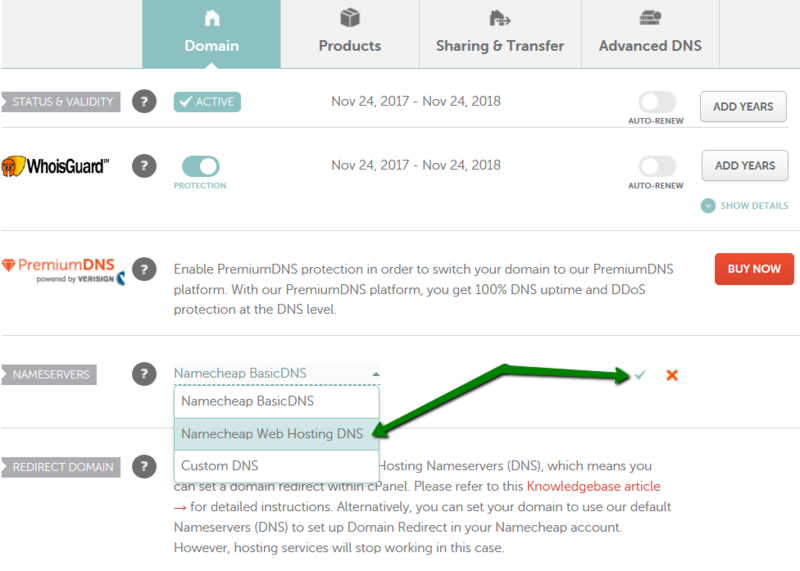 NOTE: When switching between Namecheap BasicDNS/PremiumDNS/Web Hosting DNS nameservers, the DNS changes come into the effect within one hour (24+ hours in rare cases).